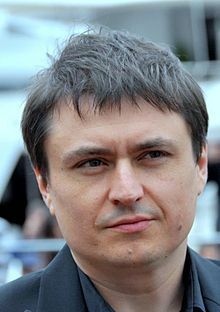 Cristian Mungiu (Romanian: [kristiˈan munˈd͡ʒi.u]; born 27 April 1968) is a Romanian filmmaker. He won the Palme d'Or at the 2007 Cannes Film Festival for his film 4 Months, 3 Weeks and 2 Days, which he wrote and directed. He has also won the awards for Best Screenplay and Best Director, at the 2012 and 2016 Cannes Film Festivals, for his films Beyond the Hills and Graduation. Mungiu was born in Iași. His sister is political analyst Alina Mungiu-Pippidi. After studying English literature at the University of Iaşi, he worked for a few years as a teacher and as a journalist. After that, he enrolled at the University of Film in Bucharest to study film directing. After graduating in 1998, Mungiu made several short films. In 2002, he debuted with his first feature film, Occident, which enjoyed critical success, winning prizes in several film festivals and being featured in Director’s Fortnight at the 2002 Cannes Film Festival. In 2007, Mungiu wrote and directed his second feature, 4 Months, 3 Weeks and 2 Days. The film was received enthusiastically, attracting critical praise and being selected in the official competition at the 2007 Cannes Film Festival, where it won the Palme d'Or for feature film, marking the first time that prize was awarded to a Romanian filmmaker. His 2012 film Beyond the Hills was screened in competition at the 2012 Cannes Film Festival where Mungiu won the award for Best Screenplay and Cristina Flutur and Cosmina Stratan shared the award for Best Actress. The film was also selected as the Romanian entry for the Best Foreign Language Oscar at the 85th Academy Awards, making the January shortlist. In 2013, he produced the next film of Nae Caranfil, 6.9 on Richter. In April 2013, he was selected as a member of the main competition jury at the 2013 Cannes Film Festival. His next film, Graduation, premiered at the 2016 Cannes Film Festival. The film was in competition for the Palme d'Or; though it did not win, Mungiu won the award for Best Director. Mungiu has said that early Miloš Forman and Robert Altman are important filmmakers who influenced him. He also respects the realism of Bicycle Thieves, among other famous realistic films. ^ "Festival de Cannes: 4 Months, 3 Weeks and 2 Days". Festival-Cannes.com. Archived from the original on 2012-10-12. Retrieved 18 December 2009. ^ "Romania picks 'Beyond the Hills' for Oscar race". Variety. Retrieved 11 September 2011. ^ "9 Foreign Language Films Vie For Oscar". Oscars. Retrieved 21 December 2012. ^ "Romania Announces Grants from 2012 Application Session". Archived from the original on 2013-06-29. ^ a b "All awards". Festival de Cannes 2016. ^ Scott, A.O. ; Dargis, Manohla (27 May 2007). "Romania rules at Cannes Film Festival". International Herald Tribune. Archived from the original on 4 June 2007. ^ McCarthy, Todd (29 May 2007). "Croisette compromises". Daily Variety. p. 15. ^ Levy, Emanuel (10 July 2007). "4 Months, 3 Weeks & 2 Days to be Shown in French Schools". Emanuellevy.com. Retrieved 28 June 2017. ^ "Abortion drama scoops two European awards". The Guardian. 3 December 2007. Retrieved 18 June 2017. ^ Staff (5 November 2007). "European Film Awards nominees". Variety. Retrieved 18 June 2017. ^ "The Césars go Hollywood". France24.com. 25 February 2008. Retrieved 18 June 2017. ^ "Nominalizari 2008". Asociaţia pentru Promovarea Filmului Românesc. Retrieved 30 June 2017. ^ "Castigatori 2008". Asociaţia pentru Promovarea Filmului Românesc. Retrieved 30 June 2017. ^ "Reitman's Juno among top contenders for Indie Spirit film awards". CBC News. 27 November 2007. Retrieved 30 June 2017. ^ Rolfe, Pamela (1 February 2009). "'Camino' leads Goya Awards with six nods". The Hollywood Reporter. Retrieved 18 June 2017. Wikimedia Commons has media related to Cristian Mungiu.